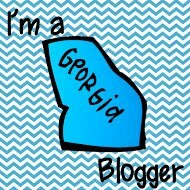 Since taking the 5-Star Blogger Challenge from Charity at The Organized Classroom Blog, I've been much more cognizant of the types of posts I write. Sometimes, though, you just need to have a little fun and do a little linking up! 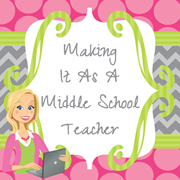 Jena at Caught in the Middle is hosting a Teacher Appreciation Link-Up. She's also giving away 3 gift cards as part of the fun 'cause she's awesome like that! You still have time to link-up, too, but not long. Head on over and check it out! Well, after seeing and hearing what many teachers' week of appreciation was like, I'm feeling pretty bummed out! Actually, really, really, REALLY bummed out, to be honest about it. There was absolutely no mention of it at all on announcements which happen twice a day, every day...sometimes more. But, you know what I decided? I'm not going to dwell on that! My students appreciate me everyday! Not a day goes by that one of my girls fails to say, "I love you, Mrs. Lundy!" My boys are always telling me about some awesome game they played or fish they caught. They all want to start conversations about life in general and share their stories. My students are huggers this year and they warm my heart! I appreciate you and all that you share with the online teaching community! Nothing is worse than feeling under valued, but I think that is why so many people have begun blogging. If there is no support system where we work, then we will build one ourselves!! But, there's always next year! Thanks for sharing your post. You led me to Jena's Teacher Appreciation Linky Party. I so appreciate my new world of blog friends. Together we lift each other up, appreciate each other, and support each other.